With not making the time cut at redlands, ambulance another team mate and I decided to head up to Santa Cruz and ride a crit. I definatly didnt have the legs for redlands(Oregon winter training, and only 4 prior races just werent enough to beat the legs into race shape for redlands) but a rest day after a brutal 90something miles, my legs felt a lot better than they have been. The power was back. Stephen and I got there really too early, so we started our warm up with a cup of coffee downtown before getting chamied up to start riding. Met up with a few other riders and rode around in the hills for about an hour before heading over to line up. Got a good position in the 86 rider starting field. We started the race and there was a tough headwind going into the 180, between the corners, narrow roads, hill and headwind, it kept things relatively strung out and moving up was a bit of a challenge. I found some good lines through the turns and held to them and kept a pretty good position, just far enough in the front to monitor what was going on and be able to react to anything, but far enough to keep from getting stuck in the wind. There were a few break attempts early in the race, but nothing was able to get away. About half way through, things started to break up, and gaps were opening. A few riders started to go off and I was pretty sure this would be the move to go with. I bridged up to the riders rolling away and looked back to see a big gap between the 9 man break and the rest of the field. We worked together somewhat, but never got too organized thanks to a cal-berry screwing things up. We kept our speed up through the course though. 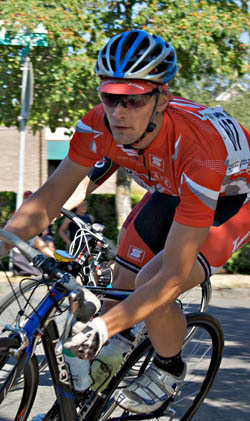 At 5 laps to go, a bissel rider attacked. I let him go expecting to hop onto another riders wheel to bring him in, there were 2 team mates in the break so it was their chore to cover. No one went though and he rode off. At 3 to go, I attacked in an attempt to break it up a bit, but every one chased me down and brought me back, I knew it was going to come down to a sprint in the break at that point so I made an attempt to save some matches. On the last lap, I moved into the 3rd wheel coming into the last corner. I thought that because of the head wind and hill, being too far forward would be a disadvantage since it was a pretty long finishing straight. I was wrong, around the final turn and it was a drag race to the finish, I got over taken at the line by a crafty sprinter to get 5th. I felt a little redeemed after having bad legs at redlands and brisbane to do well in a tough crit full of a quality N. Ca field. The race legs are starting to come. Chris, good to hear a positive report! Nice work man. Good racing.